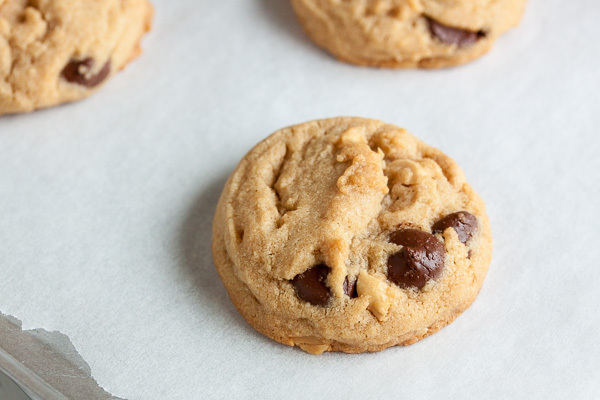 Triple Peanut and Chocolate Chip Cookies | wanna come with? 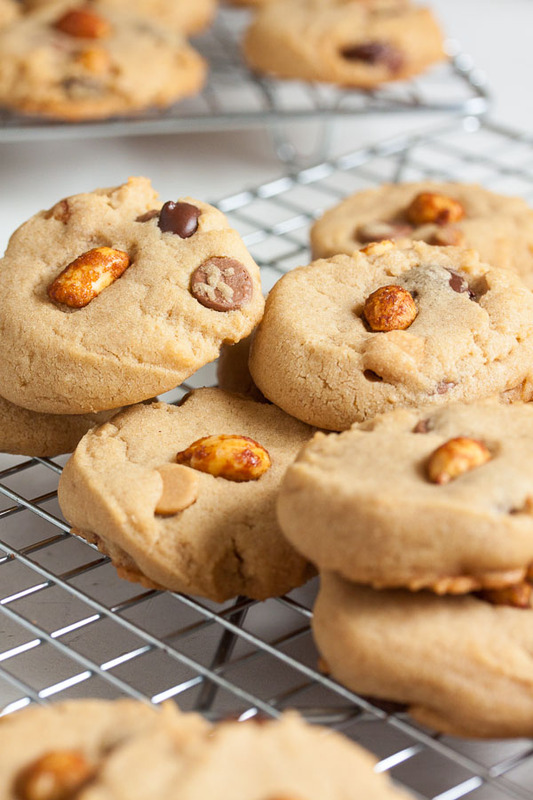 This week’s cookie is all about peanut flavour. By request. Because when your pregnant co-worker says she’s craving something peanut-y, you listen. 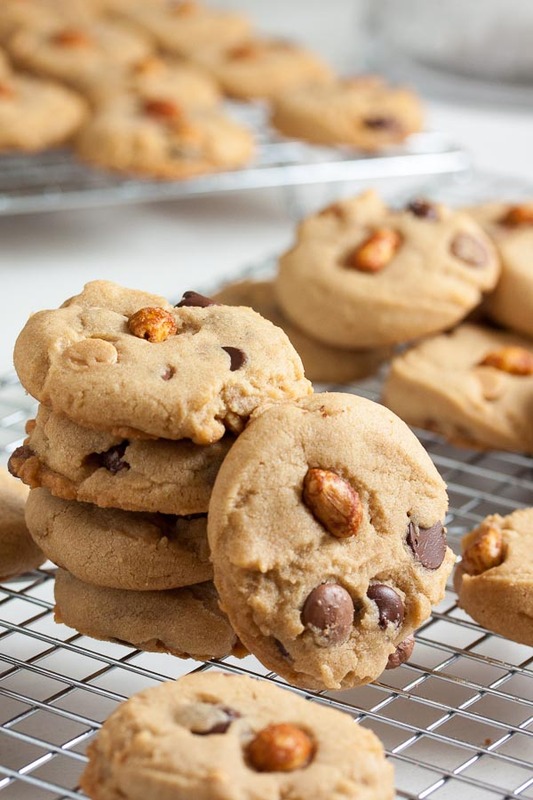 So we have not just a peanut butter cookie, but a peanut butter cookie plus peanut butter chips plus honey roasted peanuts plus two kinds of chocolate chips. Yup. This should take care of those cravings! The original recipe actually called for mini peanut butter cups, but since I didn’t have any and I didn’t want to venture out in the rain to get some (yes, we’ve hit the rainy season here in Vancouver), I just substituted peanut butter chips and some extra chocolate chips. No worries, they turned out great. 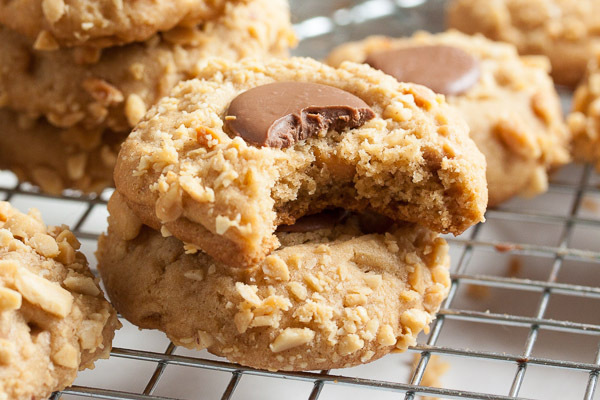 Very peanut-y, and definitely chocolate-y. If it were up to me, I would have doubled up on the chocolate, but this week’s cookie isn’t about me. And the goal this week was peanut. And seriously, everyone loved this cookie. Once again, the cookie jar emptied in just a couple days. And then I started hearing complaints that I didn’t make enough. Hee. And if you’ve been following my “new oven trials and tribulations”, this week threw a bit of a monkey wrench in things. Because this cookie? Turned out perfectly. The recipe said they would be done in 10-12 minutes, and they were. I have no idea. What are the odds that the last two cookies I made both had an error in the baking time? Sure it happens, but both of them? Oh well. All I can do is keep an eye on them as they bake. Which we should do anyway, right? Right. Times in recipes are just guidelines. 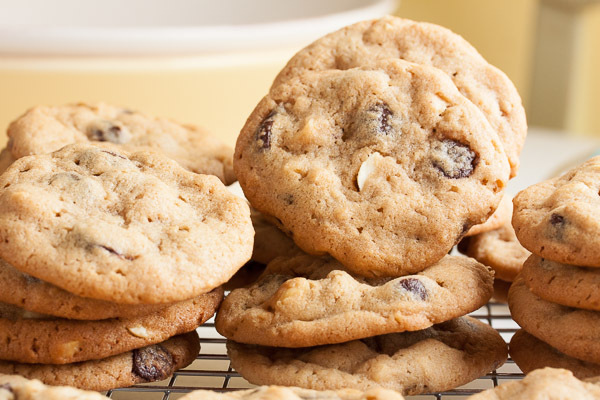 Adapted from Better Homes & Gardens The Ultimate Cookie Book. The recipe said it would make 72, and I got pretty close to that with 70 cookies using my usual slightly larger than tablespoon-sized cookie scoop. In the bowl of a stand mixer fitted with the paddle attachment, beat the butter, sugars, peanut butter, and baking soda, together on medium speed until light and fluffy, about 2 or 3 minutes. Scrape down the sides of the bowl and add the eggs, one at a time, beating well after each. Add the vanilla and beat to incorporate. Turn the mixer down to low and add the flour, mixing until just barely combined. Remove from the mixer and add in the chocolate chips, peanut butter chips, and honey roasted peanuts, either with a spatula or by hand. I prefer to knead inclusions in by hand to ensure they're distributed evenly, but this dough was fluffy enough that I didn't feel I needed to. Using a small cookie dough scoop or a tablespoon, portion the dough onto the baking sheets about 2 inches apart to allow for spreading. Press each down slightly with the palm of your hand, and top with a honey roasted peanut (optional).